Saturday 19/9/15 saw the inaugural North Yorkshire Sport Business Games kick off in the idyllic surroundings of Dalby Forest. Six teams representing organisations from around the county gathered at Adderstone fields in the forest to challenge themselves and their counterparts in 5 sporting tasks. 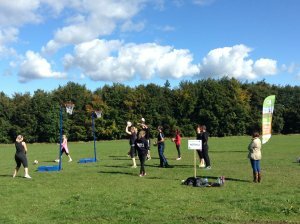 An introduction and 'drills and skills' session in archery, netball and volleyball were delivered by local coaches prior to the 10 minutes of competition when the highest number of points, goals and rallies decided a placing in each sport. The cycling was a team time-trial around one of the many tracks at Dalby, with the average overall time of the team counting. And finally there was orienteering. All the teams gathered at the end to take part in a mass participation orienteering competition, with teams employing different strategies to accrue the most points possible in a specified time. The teams of 10 were paired up to take part in 4 of the sports, galvanising and bonding those team members to achieve a common goal as well as creating a healthy competitive environment against another organisation. The orienteering created a natural finale with all 6 teams coming together! After the competition, teams congregated at the marquee for lunch, started a few ad hoc games employing their newly acquired skills and awaited the final results. The eagerly anticipated results saw the '10acious C's' taking the Business Games trophy, closely followed by the 'Glorious Misfits' in second and 'Fitmums' in third. The coaches also noted and awarded points for team work displayed during each of the challenges with the 'Yorkshire Roses' being identified as worthy recipients of that accolade. I think everybody present on the day will agree the Business Games was a great success with a number of teams enquiring when next years' event will be taking place. Leaving only the winners name to be engraved on the trophy and presented, with the first prize of a table tennis table to the 10acious C's!